"Papa play time" is what we do when Deanna is making dinner and I get them out of her way for a while. You should see him on the iPod touch- it's quite remarkable how well he can navigate his way around. Obviously, the teacher wrote what he was saying for this note, but there's no doubt the words were his own. 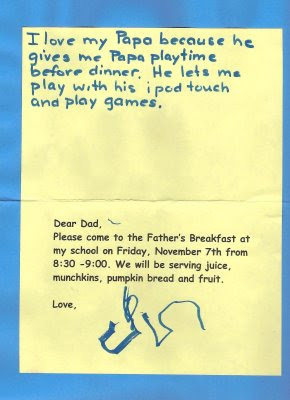 I'm looking forward to the Father's Breakfast! One suggestion. Put that note into your briefcase, or backpack, or whatever you carry around with you. When you're having one of THOSE days, pull out the card and read it. I promise that you'll be transported back into the moment, and be able to put everything else into perfect context. Great idea, Ron! I just put it in my laptop bag. And Ken- totally agree with you regarding kids and the iPhone and I think you describe it perfectly with the word "natural". The biggest problem I have with my iPod touch is getting time to play with it when Sam's not hanging off me. A tablet would be fun- for Dads too! What is a good microphone for screencasting?